Oh, to be young again - even if it brings back memories of traumatic loss. Shadow of the Tomb Raider closes out the rebooted trilogy with a bang, showing us a somewhat ruthless Lara Croft as she takes the fight to Trinity deep in the jungles of Peru. But for all the horror elements and guerilla warfare, one of the standout scenes takes place long before you start cracking Trinity skulls. Minor spoilers ahead, but it's no big secret: a flashback early on in the story shows us Lara in her much, much younger years, as she daringly climbs Croft Manor in a scene that would make any parent sick with worry. From the onset of the game's development, this playable memory had a pivotal role in developing Lara's character in ways we never got to see before. "We wanted that to add another layer of both perspective as well as humanity to Lara," says Rich Briggs, senior brand director at Crystal Dynamics. "It was certainly something that we all felt very passionate about, and it tested really, really well when we were doing our internal playtests." 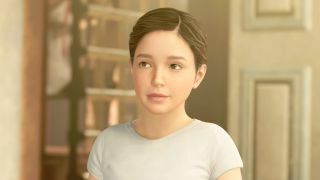 If you haven't played the chapter for yourself, it lets you control an adorable little Lara as she imagines her mansion to be a Forbidden Tomb full of adventure, narrating her escapades while scurrying up the walls and into an off-limits room packed with her father's archaeological findings. Solving an honest-to-God statue sliding puzzle tucked away in her own home, Lara finds a chamber full of her mother's things, bringing up warm memories of her parents' love for her, along with unpleasant flashes of their heated arguments. Suddenly, Lara hears her father shouting out, then a gunshot - and when she rushes to find him, he's already slumped dead at his desk. "Showing her in that life, before her father was murdered, did a couple of things," says Briggs. "One, you really start to empathize with what she lost; I think you get to see that she was always an explorer. It gives you a window into the fact that her dad was always encouraging her to be an adventure. We really wanted to give you an on-the-sticks, playable experience, where you could see her making her own adventures, making her way around Croft Manor in an imaginary way." The team at Crystal Dynamics purposely kept the scene under wraps in the lead-up to the game's launch, to give it the full emotional impact that comes with such an unexpected sequence. It's absolutely one of the most memorable moments in Shadow of the Tomb Raider, echoing the childhood flashbacks of Uncharted 4 but with much more innocent whimsy (at least until the whole 'dad getting murdered' part). And it's infinitely better than the vaguely ditzy depiction of teenage Lara that we got in the series' fourth entry, Tomb Raider: The Last Revelation. "We think that it gives you perspective on who Lara is, but also it's a bittersweet moment," says Briggs. "You get to see her in a carefree state before her life changes forever." If you're gearing up to take on Lara Croft's latest adventure, be sure to check out these 8 essential Shadow of the Tomb Raider tips you need to know before you play.